The Home Run Contest mode in Super Smash Brothers looks straightforward. You choose one of the game’s fighters and face off against an inanimate sandbag. As a 10-second timer counts down, you try to inflict as much damage as possible on the bag. Depending on how much damage you dole out, the bag could end up flying several thousand feet. But if you want to beat the world record with any character in the Home Run Contest, then you’re going to have to learn some unconventional strategies that have taken years for players to discover. 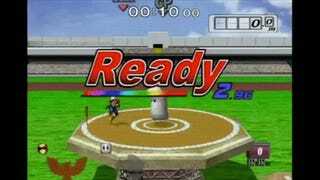 The Home Run Contest first appeared in Super Smash Brothers: Melee, a 16-year-old game that still has enough of a competitive base to merit its continued appearance in the Evolution Championship Series, the world’s largest fighting games tournament. There’s also still a competitive scene for Melee’s Home Run Contest, but it’s much smaller. So much smaller, in fact, that there’s really just one player worth noting these days: Mike “Typo” Bassett. This past weekend, as top Melee pros duked it out in the Evo finals, Typo was at home, also finding new ways to bend SSB: Melee to his will. There are still world records left to beat in Melee’s Home Run Contest, and Typo has been chipping away at them, bit by bit. Melee has 25 characters, each with their own theoretical world records for hitting the sandbag a certain distance. That said, 11,347.2 feet is the maximum length of the track. Ganondorf can achieve that score, and the Ice Climbers can also achieve it through the use of a glitch, so there are multiple players who have “tied” for the world record with those characters. The rest of the game’s fighters have more theoretical wiggle room when it comes to finding farther distances to hit the bag. Who held the previous world record? Typo himself, back when he was 16 years old. Today, Typo is almost 25. When he was 16, Typo “had a lot of free time” to spend chipping away at the HRC records. He didn’t have that much free time again until 2015, after completing his undergraduate degree. He then returned to Melee’s Home Run Contest in earnest and set about his attempt to beat the past world records placed by himself and other HRC fans in the decade prior. This past summer, he began streaming his efforts on his Twitch channel. Right now, there’s no one out there trying to beat Typo’s world records—or if there is, he has yet to find them. His main competition is a series of decade-old times, and himself. But if you want to learn how to beat Typo, he’ll be the first to share all of his secrets in his live Twitch broadcasts.